The FGBC Green Local Government Standard designates Green Cities and Green Counties for outstanding environmental stewardship. It is expected that certified green city and county governments will not only gain recognition and publicity, but also function in a more efficient manner through better internal communication, cost reductions, and effective risk and asset management. FGBC is actively working towards the availability of incentives that are based on compliance with this standard. To view a list of certified green local governments and view specific green achievements by each government use the project search database. Ginger Adair, Natural Resources Director for Volusia County Environmental Management. Download a toolkit and instructions for hosting a press conference announcing a community's FGBC Green Local Government certification. 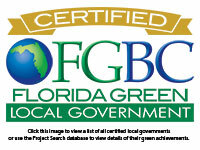 The FGBC Green Local Government Standard is similar to other green standards currently in effect in Florida and many other states, yet very unique in its target. In essence, a list of criteria is presented, and each is assigned a point value. A minimum total point value is set that represents a bar, and local governments who incorporate sufficient criteria such that they meet or exceed the bar are "certified" or "registered" as a Green Local Government. Typical components of green building programs have traditionally targeted individual buildings and land developments. One of the goals of the Local Government Standard is to increase the penetration of many types of green activities. The Florida Green Local Government Standard leverages many existing programs, and also presents new criteria. Existing programs that are leveraged include statewide programs such as Waterfronts Florida, Florida Main Street Designation, and national programs such as Tree City USA from the National Arbor Day Foundation. Examples of criteria that are not defined by an existing program include developing local government energy reduction plans, instituting an environmentally preferable purchasing program, utilizing green fleet management, and working with water utilities to promote conservation. Learn about the Florida Green Local Government Standard. Contact the Florida Green Building Coalition (FGBC), which operates and maintains the standard. An individual will be available to introduce you to the process. Designate an office, department, or individual as Project Coordinator. The Project Coordinator will be the main link between the local government and FGBC. A project evaluator will be assigned to your team by FGBC. Submit the Registration Form along with a deposit. The Registration form is contained within the Application Tool (Excel file). Determine what criteria apply to the local government. Since the standard's criteria are organized in terms of generic local government functions, the coordinator will perform an exercise to determine what criteria will apply to the local government. For example, if there is no public electric utility, certain criteria will not apply. The exercise will enable the Project Coordinator to determine the Maximum Applicable Points Total . The Project Coordinator will also determine which department is likely to perform each function, in order to distribute criteria effectively. Conduct a local government assessment review in cooperation with departments. After criteria has been distributed to appropriate departments, individual departments review the criteria and indicate what has been done or is planned for implementation, and also indicate what is likely to be considered in the interest of achieving the standard, and for the benefit of the local government. Conduct a local government evaluation. The Project Coordinator collects all departmental information, and determines where the local government currently falls in reference to the suggested levels of compliance. The Project Coordinator then prepares a summary report that is sent to all applicable local government departments. Schedule implementation meeting to outline path towards qualification. The coordinator then assembles a meeting of departmental representatives to discuss the status in reference to the standard. An interactive process then begins whereby areas of cooperation are explored, potential sustainable and green improvements are identified, and a plan is outlined with the intent of brining the city/county towards compliance with the standard. Designation Levels are awarded based on achieving percentages of the Maximum Applicable Points Total. Submit application and all necessary documentation to FGBC for evaluation. At which time the local government believes they have met the minimum requirements of the standard, a submittal is provided to FGBC with necessary documentation such that the efforts can be reviewed, and the designation awarded. An Excel spreadsheet helps a local coordinator apply the FGBC criteria to local government departments, assign responsibilities and determine which criteria are applicable to the local government body. This tool allows the local coordinator to filter on key criteria for reporting progress, and serves as an electronic application form. To start the process enter names of Local Government Departments in the designated spreadsheet rows. Worksheets allow you to determine which criteria apply to your city/county, and help you to track progress as criteria are implemented. Tools are provided for you to flag criteria according to appropriate department and staff member. Point totals are tallied for each government function. The "Filter Tool" contains all criteria, and allows criteria to be organized according to a number of variables. Point totals are tallied for the entire program. A complete application package will include an electronic copy of the completed tool or hard copy of all "sheets" except the "filter tool", all required documentation, and the required application fee. Applications shall be compiled and circulated to the Florida Green Building Coalition Green Local Government Committee, past applicants, and project evaluators for comments. The comment period shall be at least thirty days. Following the public comment period, each application and its public comments shall be reviewed by the Florida Green Building Coalition Green Local Government Committee, which will make written consensus recommendations to the Board of Directors for suggested revisions to the standard along with the original applications. The Board of Directors of the Florida Green Building Coalition, Inc. shall adopt, adopt with modification, or reject each application for change. Periodic review. At least triennially, the provisions set forth in these Green Local Government Designation Standards shall be reviewed by the Standards Committee of the Florida Green Building Coalition, Inc. in collaboration with other stakeholders. At a minimum, this review shall include consideration and evaluation of changes in the law, technological innovations, and comments and requests received from interested parties. All applications for revision shall be disposed of on an annual cycle such that applications received prior to the last working day of June 15 are included in the application review cycle that concludes no later than September15. The Board shall approve any changes to the standard by the last day of October in any year in which it is to be revised. Any new standard shall be in placed on the web site (along with the current standard) no later than November 15. The effective date of any new Green Local Government Designation Standards shall be January 1. Only those proposals to change these Green Local Government Designation Standards that are received on or prior to June 15 shall be considered for the revisions to these Green Local Government Designation Standards that may become effective on January 1 of the following year. The reference guide and module text, graphics and examples may be updated at anytime by FGBC; so long as they are of a clarifying nature. The Florida Green Building Coalition contributed to development of the Standard and now oversees all certifications. The Miami Dade Department of Environmental Resources Management put together educational modules on fleet management and on landscape maintenance to assist local governments with the process. Sarasota , Alachua and Miami-Dade counties and the City of Gainesville helped with creation and review of the standard. City of Orlando representatives also participated in development of the standard. It is envisioned that successful local governments will create and enforce landscape codes that help preserve Florida natural ecosystems, conserve water, create pedestrian-friendly environments, and follow green policies throughout their own organization in everything from ball field maintenance to in-house recycling. The standard is presented in such a way that it is much more than just a program - it is a powerful tool. The guiding documents of the standard are designed to act as educational material for a wide audience of readers. The documents not only present opportunities for a local government to "be green," but also provide examples and resources covering how to do it. In many cases, based on current application of criteria in pilot Florida cities and counties, as well as other US local governments, quantifiable results can also be presented such as cost reductions, tons of CO 2 reduction, pounds of waste diverted from landfill, etc. With such a broad scope and the uniqueness of tying in many suggestions, resources, existing programs to leverage, etc. into one comprehensive standard, a "one stop shop" of information has been created. In this case, the standard is an excellent reference for Florida local governments to refer to when trying to accomplish environmental goals - whether from a regulatory, a risk / asset management, an economic development, or a cost reduction standpoint. The standard is meant to be a useful reference even for those local governments who have no interest in becoming certified, but are trying to accomplish a singular goal, rather than the big "green" picture. For those that do wish to become certified, there are flexible paths to qualification so that cities and counties can tailor qualification to meet their goals, while still maintaining the well-rounded profile that has come to define "green". Flexibility is also important, for no two local governments look alike, nor do they all perform the same functions. Part of what started the development of the Florida Green Local Government Standard was a desire of the Florida Energy Office and the US Department of Energy to achieve "Energy and Environmental Integration" within government. A solicitation was announced, and The Florida Solar Energy Center (part of the University of Central Florida ), the Florida Green Building Coalition, and Miami/Dade Department of Environmental Management (DERM) teamed together on a winning proposal. The original request for proposal indicated that while energy and environmental elements are tightly linked in natural and economic systems, federal, state, and local governments have traditionally approached these two issues by segmenting them into separate organizations in a way that obscures their connections. One goal of the Florida Green Local Government Standard is to bring together entities with common objectives and overlapping interests to develop integrated energy/environmental solutions to statewide as well as local issues. Such integrated energy/environmental strategies offer new opportunities for increased energy efficiency, multi-pollutant prevention, and environmental improvements as well as greater operational efficiency, increased customer service, and expanded public acceptance. These goals can be well accomplished by incorporating the actions of green building into the framework of local governments, through the process of striving to meet a green building standard. Part of the process for determining qualification with the standard is to look across all local government departments to determine what is currently being done, what the needs/desires are, and what remains to be done in order to qualify. This process inherently requires extensive communication between departments, eventually identifying areas of potential cooperation to better achieve common goals. Another aspect is that as local governments learn more about how being green can help them accomplish their goals, they will see the benefit of encouraging the private sector to apply the same principles through the creation of green homes, green commercial buildings, and green land developments. There are already standards in effect for these sectors in Florida , and green local governments can increase the penetration of green buildings and land developments through various incentives. The City of Gainesville recently passed an ordinance giving a $300 discount on building permits for certified green projects, as well as free fast track permitting (a $350 value). They are also actively promoting and publicizing such projects. Green building is not just good for the property owner or those living on the property, it is good for the whole community. Developing a standard, rather than a comprehensive guidebook is important for a number of reasons. Creating a standard and setting a bar gives local governments a meaningful goal to aim towards. The bar is designed to be a realistic one (based on pilot city/county involvement), and gives local champions of the effort something to point towards in order to keep things on track. It may provide enough driving force to push a local government who would have only achieved 50% of the bar with a simple guidebook achieve 100% of the bar such that they can become certified. The certification will allow a local government to publicize their efforts in order to gain the recognition they deserve from the local community as well as the state. Other stakeholders will also be taking part in publicizing the existence of the standard, as well as the efforts of certified cities and counties. It is also envisioned that the standard will act as an excellent metric on which to base eventual statewide incentives to cities and counties who become certified. It could also be used in the regulatory arena, where a non-compliant local government could be given the option of achieving the certification, as opposed to other regulatory actions that may be taken against them.